LOS DIAS 11, 12 Y 13 DE JUNIO CONTINUO EL RECORRIDO TACANDO PUERTAS PARA PRESENTARSE EN PERSONA EL CANDIDATO ING. 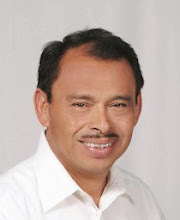 APOLINAR FLORES VELASQUEZ Y SU EQUIPO DE CAMPAÑA. LA ACEPTACION POR PARTE DE LA GENTE HA SIDO DE LO MEJOR TODOS ESCUCHANDO LAS PROPUESTAS QUE TIENEN COMO META CAMBIAR POR COMPLETO LA IMAGEN DE LA ADMINISTRACION MUNICIPAL A TRAVES DE UN GOBIERNO QUE ESCUCHE Y ATIENDA LAS DEMANDAS DE LA GENTE CON OPORTUNIDAD, EFICIENCIA Y CALIDAD. EN ESTAS REGIONES LA CIUDADANIA MOSTRO NECESIDADES ENFOCADAS ENTRE OTRAS POR LA CARENCIA DE AGUA POTABLE QUE LLEGA POR TANDEOS, DEMANDARON VIGILANCIA POR LOS ROBOS CONSTANTES Y PROBLEMAS CON LA SEÑAL TELEFONICA PARA CELULARES AL CARECER DE ANTENAS CERCANAS QUE LES DEN ADECUADA COBERTURA. LA PROPUESTA QUE ESTA VEZ TRAE EL PARTIDO DEL TRABAJO ES MUY AMPLIA Y CONTEMPLA ATENDER TODOS LOS REZAGOS Y ATRASOS EN QUE SE HA SUMIDO ESTA DEMARCACION. MAÑANA SABADO 15 Y DOMINGO 16 DE JUNIO ESTAREMOS EN MONTE BLANCO RECORRIENDO LAS CALLES HACIENDO ACTO DE PRESENCIA TAMBIEN EL LIC. FELIPE FERRER BARCENAS QUIEN ES CANDIDATO A LA DIPUTACION POR XVI DISTRITO CON CABECERA EN CORDOBA. LOS ESPERAMOS Y QUIEN DESEE AGREGARSE AL RECORRIDO SIN DUDA SERA BIEN RECIBIDO. EL RECORRIDO DE ESTA SEMANA FUERON POR LAS COLONIAS GARDENIAS, LA LLAVE, LAS FLORES, SAN PABLO TLACOTENGO, ZACATAL Y PUEBLO DE LAS FLORES.